The little guy is turning 3 years old and it is his last year of being a toddler. Boys always want to explore the world around them and this should be celebrated with a perfect gift that suits their playtime needs. There are so many gifts to choose from it can sometimes be a little daunting as a parent trying to find the best gift for his birthday or Christmas. So, we have put together 21 gift ideas that he will love and enjoy, so whatever your concerns feel free and rest assured that we have got the best of the bunch. 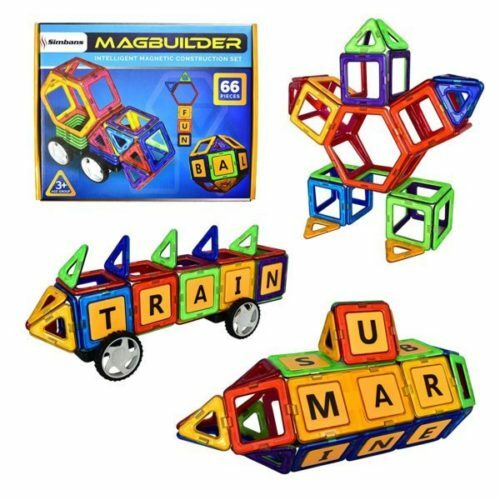 There are loads of toys in this review, some are sporty, some educational, others artsier focusing on imagination development, so whatever your looking for there is something here for your little guy. 1.9 Build your own race car! 1.23 What are the Best Birthday Presents for 3 Year Old Boys? 1.24 What Should I Get a 3 Year Old for Christmas? There are loads of different approaches when buying a gift for your little one and some parents choose gifts by how they approach learning and development. Sometimes this can be through creative arts and other times this is through language-based learning. So, whatever reasoning you might want to consider when choosing a gift, it is probably ideal making sure one helps their growth and development a little. Some science experiments for toddlers, for example, games for improving literacy also, math, and toys that improve social and emotional growth are all worth choosing. We have a huge range of toys gifts that can enhance the wellbeing of your child, through fun interactive freeform play, plus loads more. We have chosen most of our gift ideas to give the best value both in price, quality and long lasting benefits for your child. Every child goes through a dinosaur phase and whether that is because of “Jurrasic park” or from some other movie, either way, dinosaurs are top on the list of boys gift ideas. They love to create worlds, use their imagination and go wild with new adventures and something always ends up getting eaten. 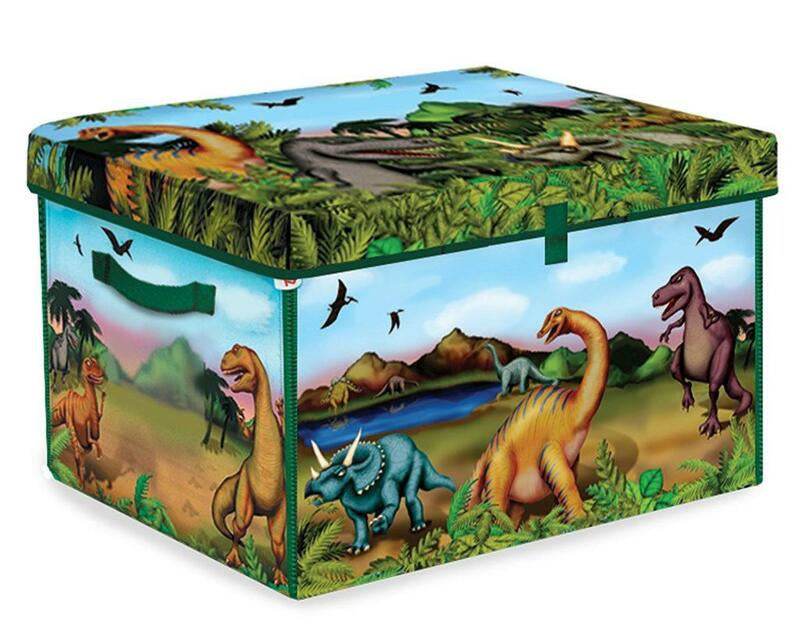 This ZipBin dinosaur collection is an award winning toy and the box set comes with loads of dinosaurs inside and a convenient box to store them in. There are 2 bonus bag dinosaurs included and a play mat that is well-made. The Neat-Oh dinosaur graphics on the box and mat are of a good standard, which adds to the child’s imagination when thinking Jurassic. This playset can hold up to 160 dinosaurs at a size of 5 inches each and will be a good place to start a dinosaur collection. This pre-historic gift idea is a fun way to encourage the imagination of the little one, so they can start to do role-play and develop social and emotional skills. Music is a big part of our culture and children that start young with learning to play a musical instrument develop intellectual skills as well as emotional and hand-eye coordination. 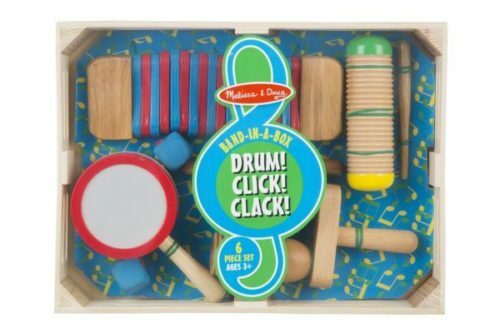 This drum click clack gift set is why a gift like this can be one that lasts a lifetime and encourage their hidden musical talents to come and be expressed. This instrumental music set has 6 different instruments and each one offers a slightly different experience, which develops listening skills and helps fine tune their motor skills. Include in the box set are; kokiriko, drum, agogo, 2 mallets and guiro shaker. These are ideal introductory instruments to begin introducing musical concepts, ones that every 3-year-old boy should begin exploring. This is designed for children aged 3 + and comes with a wooden box the toddler to put them away after use. This is a unique gift and one that is stunningly crafted and finished with a rainbow finish that has been hand finished. 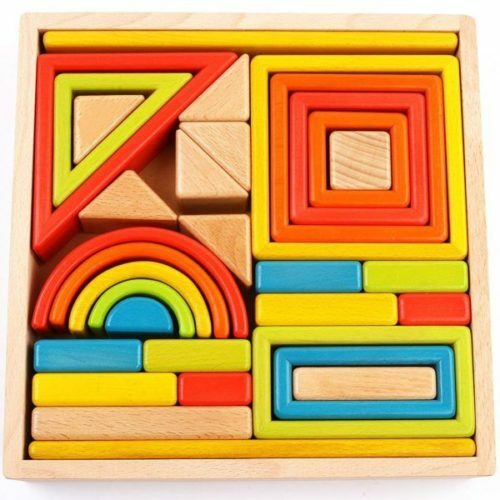 The natural wood blocks are handcrafted and the cubes are vibrant, colorful and stunning to look at. This is iPlay at its best and with stacked wooden feel, this is one that any toddler aged 3 years old and above will enjoy. This will help with “how to match” concepts and help will early learning ideas through building games and activities that the imagination naturally conjures up. The natural wood is ultra-smooth and the arts & craft blocks have 100% risk-free materials with no lead and unwanted nasties like BPA. The 3-year-old boy is always wanted to learn and how well he can do everything, which is why this gift is perfect for learning with. They can have fun with the colored bears and sort them out into their own colored tubs/pots, which is the beginning of them learning to count. Montessori is a famous brand and Skoolzy is known for producing quality made products, which is why this comes recommended. 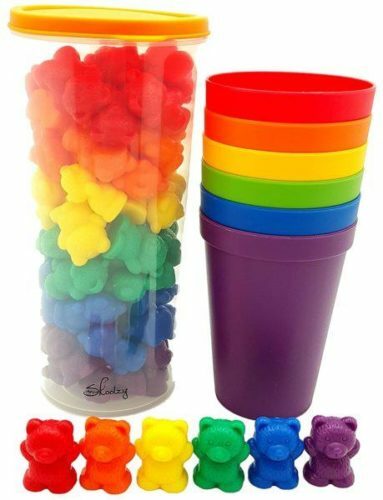 There are 60 different colored rainbow bears in total and with 6 separate sorting cups, the games can get interesting. All of this can helps them prepare for preschool and begin the journey of learning how to count in a fun way. There is a free download that helps guide them along the journey of learning and also make the games begin. This Flybar foam stick is a jumping riot with horseplay at its best, which is why this idea is the perfect gift for any little boy. 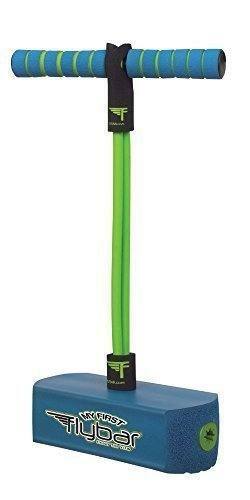 They have so much energy and with a little workout on this pogo stick your sure to help burn some of that up. This is made for toddlers and children who like to jump around and specifically for 3 years old and above. The weight of this is designed to support 250 pounds and with durable foam, this will be a fun way to let the mischief be in one place at one time. Parents and grandparents both agree this is an ideal gift for those children that find themselves indoors a lot and struggle with using up that desire for active playing. 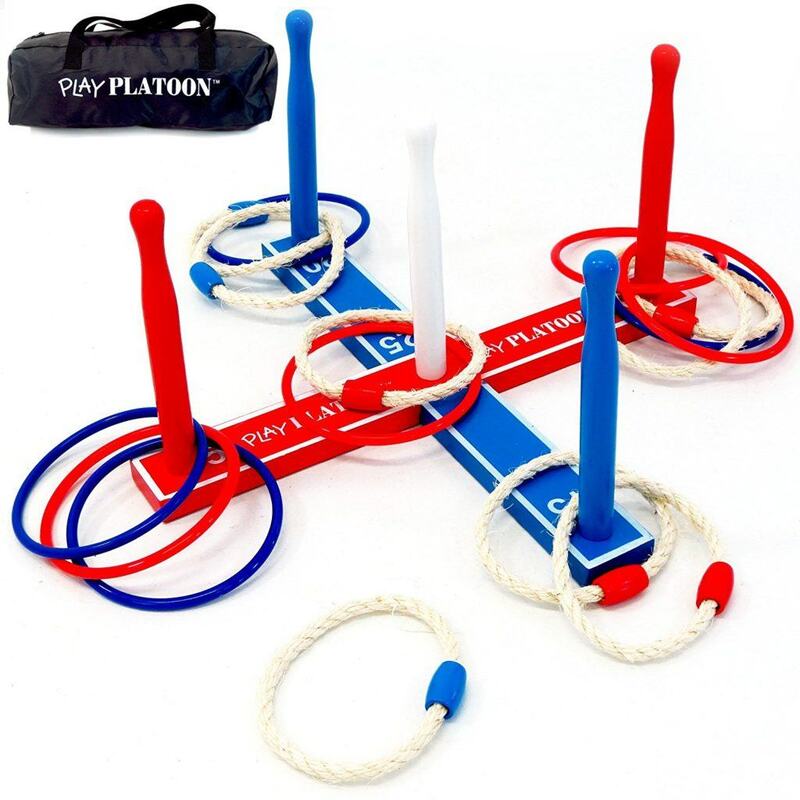 A parenting tip here is, if your child is struggling with balance or coordination this then a safe, fun game that is great for them to build up hand-eye coordination and other motor skills. This is easily managed with good grip handles and the soft foam base, which is why this present can go a long way in developing them and being a (real) hoot. 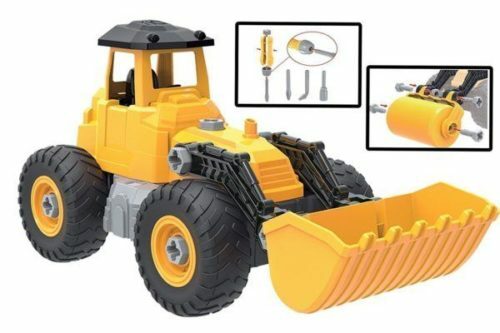 This is a toy that every boy should have and with hours of fun, this will be a building play set that sets the imagination off and engineering construction beginning. STEM learning is a great way to teach them the basic of how magnets work and with some creative DIY this gift idea is a sure way to educate through motor skill play. Building games and activities have always been a consistent toy for little boys for years. Some things have not changed, which is why a gift idea like the magnetic blocks is a great one for birthdays or any special occasion. The play set is designed for children aged 3 years old and over, but some parents will find this playtime quality time with their special little boy. The 66 pieces included in this boxset make this possible, 2 people can easily play together with this gift set with hours of enjoyment to be had. Jr. stomp rocket is a child-friendly way of getting the kids outdoors and playing with each other. The idea is to see how high you can get the rocket to travel through the air. This is a fun activity and I like how it encourages the kids to play outside and with each other. The kit is designed for children aged 3 years old and above, which makes this a great gift for a birthday boy. The kids usually end up trying to STOMP as hard as they can and challenge each other to see who can get the rocket the highest. With it being 100% kid-powered this rocket is down to how much energy they put into it and with hours of play together they will be certainly using up their energy. 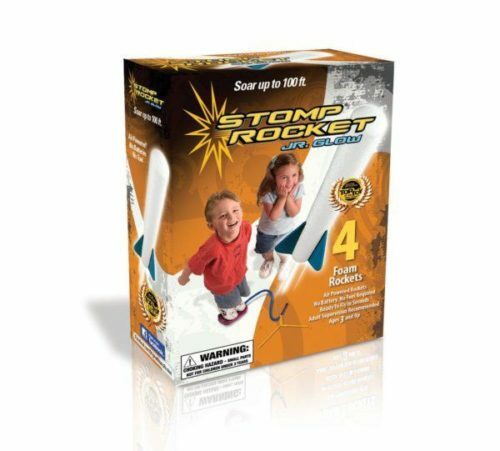 The design of the Stomp Rocket is safe and easy to use and requires no batteries to get this into the air. This can reach up to 100 feet and awesome to see fly high into the sky, kids go crazy for it. This great present will aid you three year olds learning and understanding even before he gets to school. Designed with educators, you’ll both make the most out of this. 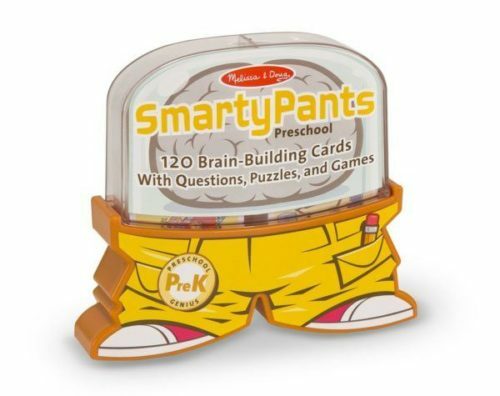 Included are 120 cards, each with a unique question, puzzle or game that will let your child develop their cognitive ability. The fun design of the cards get kids excited about learning and it will be so much fun, they won’t even realize that they’re not playing a game. Build your own race car! 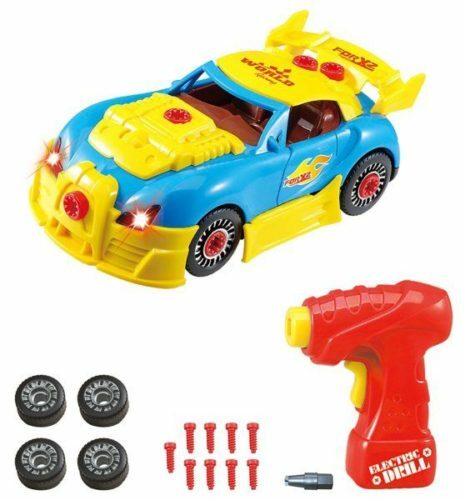 This builds your own car is perfect for any three year old that has taken an interest in taking things apart. Now they can have this toy instead of a remote control! This present is not only fun, but it develops fine motor skills in children aged 3 to 7 years old. With 3 birthdays down, your little boy must be in need of a practical storage space to store all of his presents. These 12 plastic bins are not only practical, but the choice of five colour schemes means that it will suit any room in the house. The 12 bins are made from rugged plastic and wipe down easy enough, so does the sturdy wood that, so easy to clean. The bins themselves come in 2 sizes, you get 4 big bins and 8 smaller bins, fitting everything from books to dressing up clothes in them. Any three year old boy would think that this is the ultimate birthday present, and I’m pretty sure Dads would think that it’s a cool gift too. Building this vehicle is great fun as it encourages play-based learning. Building it and taking it apart again and again in different forms (there are 55 pieces in total) leads to a more imaginative child that has developed fine motor skills all before they get to kindergarten. 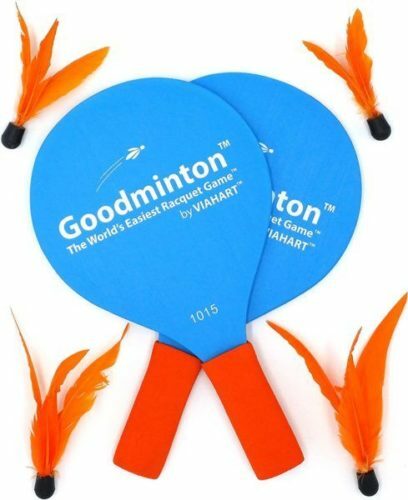 Goodminton is marketed as the worlds easiest racket game and can be a great introduction for your three year old boy into the worlds of tennis/badminton/squash. As they develop their skills, they’ll master motor skills and learn about healthy competition. 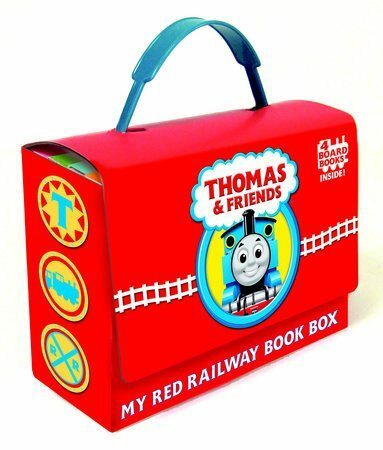 Thomas the tank will always be a childhood favorite, and any three years old would love Thomas and friends as a gift. This set contains five different stories all packed together in the handy little box. The box comes with a Velcro strap to ensure it stays closed and a sturdy plastic handle so your little one can carry them anywhere. Reading for fun, as a bedtime story or to friends is a good way to get your child interested in reading from an early age. Which is important for IQ in later life. 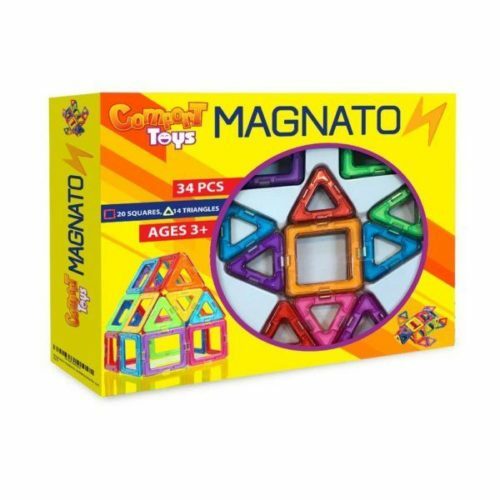 This magnetic construction toy will enrich your three year olds imagination and intelligence by helping them to understand how magnets work and how to build out of them. Containing 34 pieces (20 squares and 14 triangles), your child can build just about anything that they can imagine. From 2d shapes to 3d shapes, let your child explore what they can make. 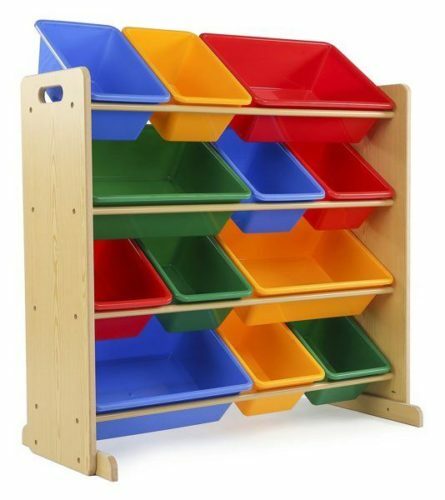 Made from nontoxic plastic, these high quality durable magnetic building strips are really built with safety in mind. With no sharp edges or corners, no fingers are going to get hurt. happy days. 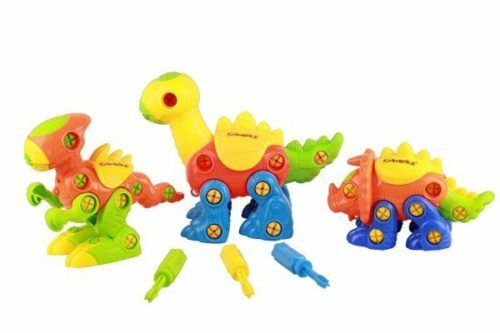 Constructing your own dino has never been more fun and with 106 different pieces, your child will master basic engineering, motor skills and perhaps most valuable, patience. Puzzle solving will help your boy develop the skills he needs to excel in kindergarten, a great head start in life. If you’re having a yard party for your child’s 3rd birthday, then this is a must-have! Made from high quality, durable wood, this yard toy brings the fun of the carnival to your doorstep. Play with others and teach your child how to win. de from plastic. Also included is a handy bag so you can transport it with ease, or put it away neatly. Every three year old needs a set of balls to play within the yard. Whether its football, basketball or soccer, this set will have them all, and in a miniature size so your little boy can handle them better. 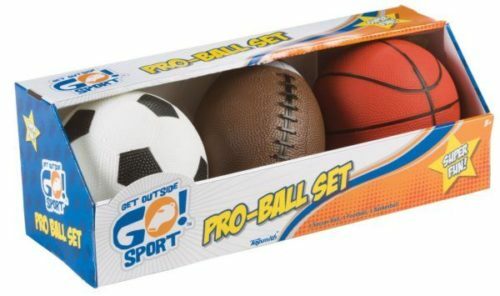 Made from foam, and designed for 3+ year olds, these balls are a perfect tool to get your child running around and into their first sport without the fear of injury. Little athletes should rejoice with this squishy ball by Diggin Jr. If your three years old has developed a passion for football, then this is the gift for them. Soft and squeeze, this ball is made for the small hands of a three year old. 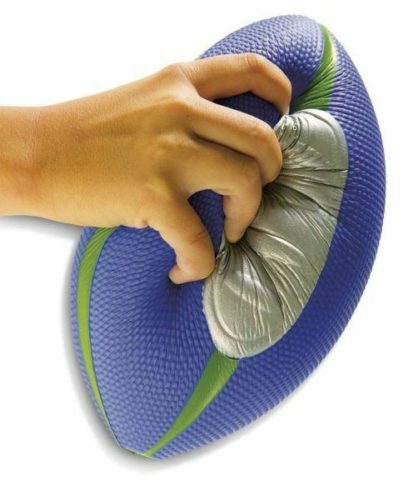 The fact it’s so soft means that it won’t hurt your child if they decide to kick it or if it accidentally hits them in the face. A great first football. What three year old doesn’t love bubbles. What doesn’t three-year-old love dinosaurs? 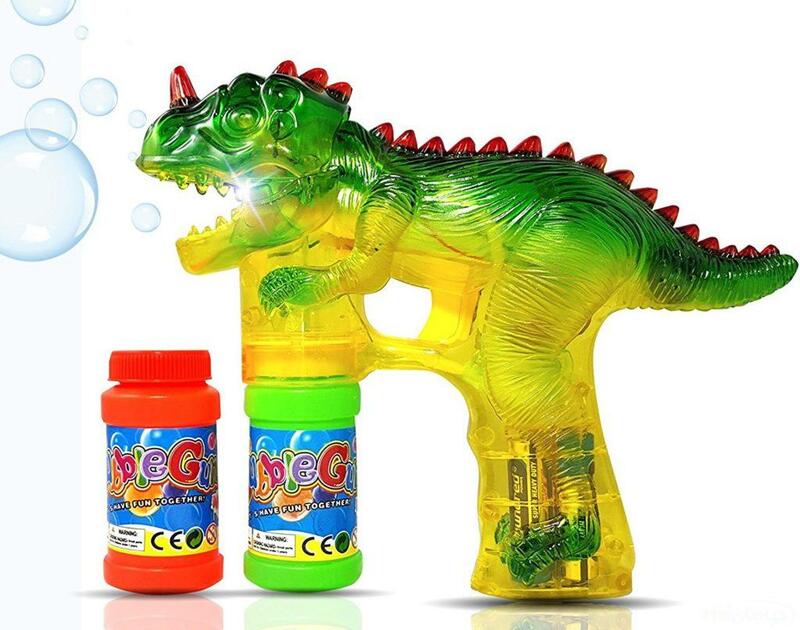 Combine the two and here you have a dinosaur bubble shooter gun from haktoys. This green dino needs three aa batteries to operate, but they’re included with the set. As is a refill of bubbles so you can shoot all day. The fun doesn’t stop there though, the dino comes with flashing LED lights so when you’re shooting, this dino lights up the room. 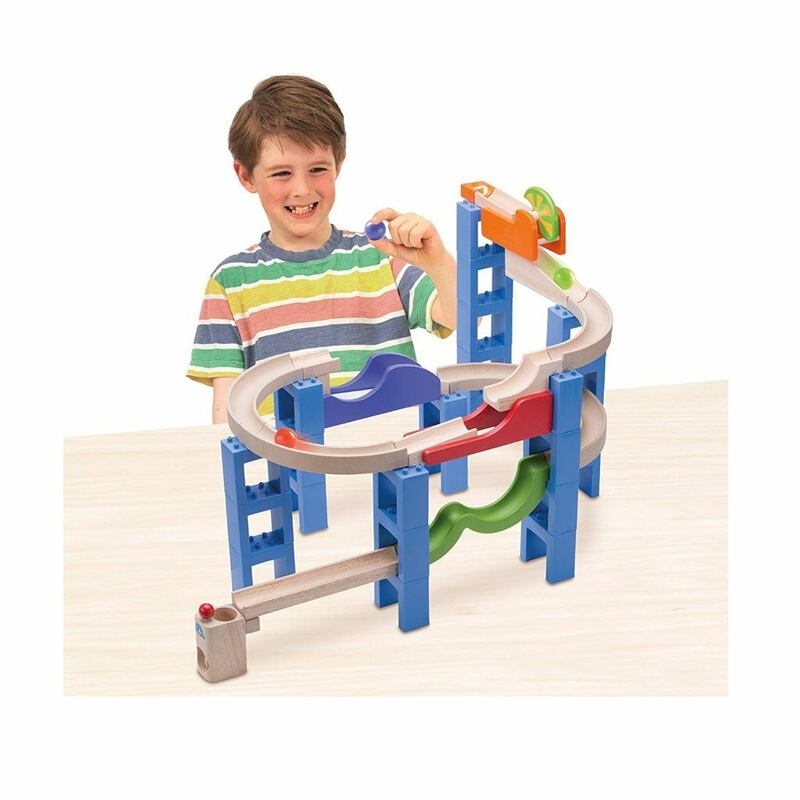 This amazing spiral track will promote your boy’s intellect, creativity, originality and concentration skills, while at the same time being tons of fun. The set is made from eco-friendly materials such as rubber wood and uses nontoxic paints, so it’s safe for your little one. Containing 36 individual pieces, the potential for your child to create something unique each time is endless. Designed for 3+ year olds in mind, this set is easy to use and just as much fun to play with. What young boy hasn’t dreamed of having a big red truck to drive. Now you can make that dream a reality with this present from Melissa and Doug. 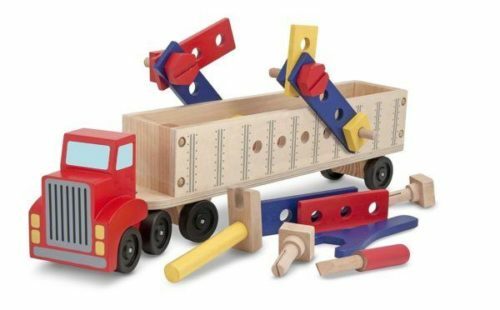 The big red truck is made entirely from wood, including the wheels, which are smooth rolling. The trailer fits in all 22 pieces neatly so the truck stores away nice and tidy at the end of playtime. 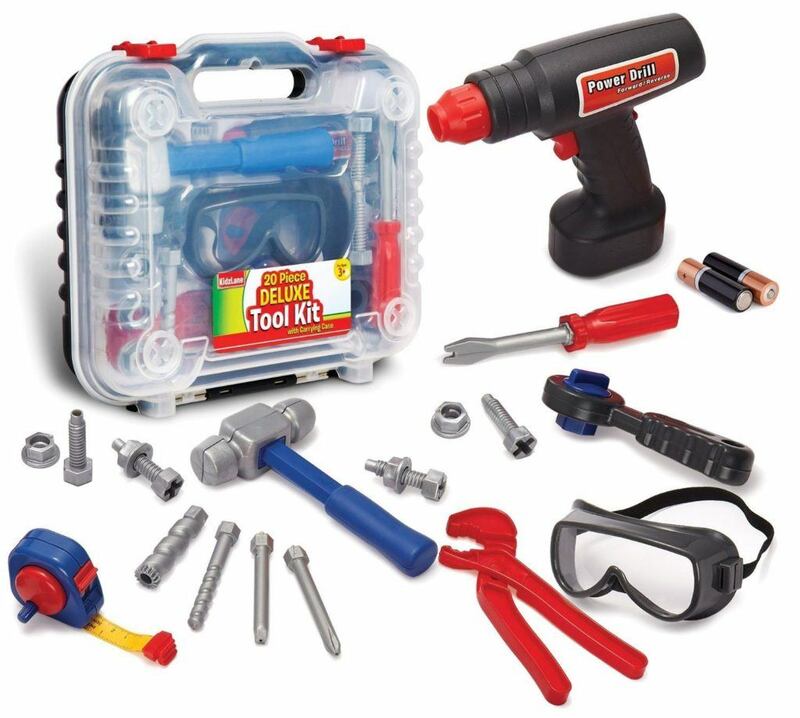 A tool set for three year olds, he’ll be making home repairs in no time! The set contains 20 different pieces, including a cordless electric drill and safety goggles, just in case things start getting hairy. The whole kit fits neatly into the durable plastic case that you’re able to carry around wherever you might be needed. With so many tools at your boy’s disposal, it’s time to unleash their inner workman! What are the Best Birthday Presents for 3 Year Old Boys? Any of the gifts reviewed here would be excellent to give to a 3 year old birthday boy. If his birthday is in the warmer months of the year, some of the toys which can be used outdoors would be ideal. At the age of 3, kids can often start to follow and understand simple board games. So, these are also a great and inexpensive gift for boys of this age. When your child turns three, it is likely you will see a vast improvement in their counting and language skills. It is for that reason that an educational gift, toy or game is an excellent choice of gift on a 3rd birthday. Take time to sit with your child and help them learn some new skills. They will love spending time with you, and learning won’t feel like a chore when they are having fun at the same time. What Should I Get a 3 Year Old for Christmas? Christmas is an extremely exciting time of year for toddlers! Again, any of these gifts would be ideal to give on the special occasion. You might like to focus more on indoor toys which will keep your little one engaged for hours when it is too cold to play outdoors. Building sets are a great choice, as they can be used over and over again, and can be used with or without adult help. Many parents like to gift their child a ‘big’ present at Christmas time. Some popular Christmas gifts include a new bike or scooter, or an electronic gadget. Your toddler probably won’t appreciate the latest games console, however a toddler-friendly camera or smartwatch can be a great choice which will again offer hours of fun. Christmas is a time for the family to spend quality time together having fun. Choosing a craft kit, board game or other activity to enjoy with your child can be an excellent Christmas gift. Not only will the whole family have fun doing the activity, it’s also a great way to improve communication together. Hopefully the ideas above will have given you some inspiration on what to choose for your toddler on a special occasion. Toddlers have a wide, varied range of interests, so there is no one perfect gift for every child. It’s a good idea to think about their interests, such as a favorite animal or cartoon character, as this can help lead you in the right direction when it comes to finding a gift they will love. Also think about what they already have and what they need. For example, if winter is coming up they might need a new jacket or some warm pajamas. And don’t forget to think about where you are going to store all the new gifts once they are unwrapped!